Expert Google Adwords Management – For Dog Trainers Only! It’s hard getting dog training clients. The veterinary clinics you’ve approached already have existing relationships with other dog trainers. The groomers and pet stores aren’t returning your calls and they’re certainly not sending you enough clients on a consistent basis to cover your overhead. Maybe your car wrap brings in some dog training clients– or maybe it doesn’t. A client this month, maybe a client next month. And you’re getting tired of hanging out at the dog park handing out business cards. Sure, you pick up a client here and there. But it’s not the type of consistent stream of new clients you need to get your dog training business to the next level. Maybe you’re dreaming of hiring another dog trainer so you don’t have to work so hard. Or you’d like to rent a building so you don’t have to train outside in bad weather. Perhaps you’d like to buy a new truck or SUV or minivan to haul your dogs around in. Whatever it is… if you don’t figure out something fast, you won’t be getting any of that fun stuff. Heck, you might even have to go find (gasp!) a real job. Especially in this economy when both new and old dog trainers alike are dropping like flies and giving up on their dreams, it’s especially important to have a way to get an endless stream of calls from quality, high paying desperate dog owners. I’m going to share what has been working for us. Sheila had originally called me, depressed. You’re gonna get Google spanked, I told her. “So what then?” she asked. I looked at her account. Sure enough, it was a mess. She was using “Adwords Express” — Google’s “dumbed-down” version of Adwords. It was easy to see how she had burned through a lot of cash. “I’m not good with technology,” she said. “I understand. And I can definitely help you,” I said. I get amazing results with the Adwords campaigns I manage for over 35+ other dog training companies. For every $1,000 invested we’re typically getting back $4,000 to $9,000 worth of new dog training clients. She was skeptical but agreed to give it a shot. I had one pre-condition: She had to answer the phone every time it rang, if possible. And she had to return each missed call within 24 hours… but preferably on the same day. Since she was cool with that I started to work on her Google Adwords campaigns that night. By the end of her first month with me her campaigns did phenomenal: She averaged 1-2 calls every other day and ended the month with nine new clients averaging $1,500 per client. The second month we ran the campaign was in December. We figured we’d increase the budget a little in anticipation of the onslaught of callers with new Christmas puppies. But by December 10th she called me again. This time she sounded worried. “THE CALLS CAME IN SO FAST AND FURIOUS, I PANICKED! Now she’s working less and making more. Needless to say, she and her family had a very merry Christmas. And a very busy holiday season, too. What If You Were The Most Successful Dog Trainer In Your City? People with money who are looking for someone to help them train their new puppy. Families who want better obedience from their dogs. Singles who want their dogs to have better manners. It’s the same with Google Adwords. Regardless, you have better things to do than to spend months of your free time trying to learn the frustrating art and science of online marketing. You should be outside training dogs and signing clients, not trying to figure out which “negative” and “modified broad match” keywords to use. “Adam has a brilliant system for getting the phone to ring.” — Justin Rigney, Knoxville, Tennessee. “It’s working really, really well! We’re pretty much overbooked at this point.” — Lianne Shinton, Fallbrook, California. “Since last Friday (I can’t believe it’s only been a week!!!!) we closed 5 sales!!!! I CAN’T believe it!!! I know i am awkward and under priced at this point until Molly gets to me I presume… but who cares? Even the way i am now it’s GREAT! THANK YOU SO MUCH. From now on I guess I will just keep you updated monthly or with anything that would be extraordinarily for us!!! We LOVE you and your service. “Phones have been busy. We scheduled 5 demos yesterday. I’ve had people ask if I’m nuts spending this money, but it’s working..” — Sandy Brady, Longmont-Firestone, Colorado. Then I’ll set up a hosting account and put a landing page on that domain. Don’t worry if you don’t know what that is. I’ll take care of everything for you. The landing page has tested, expert copywriting and intelligent design that has been proven in over 40 markets to get dog owners to call. The landing page also uses five (5) call tracking, forwarding and recording phone numbers. This works seamlessly when your clients call and you’ll be able to know exactly which leads came through the landing page. It also allows us to track on a very granular level which keyword searches are triggering calls and which are not. As far as driving targeted traffic to the landing page, I use a proprietary approach to managing Google Adwords campaigns. Because my team and I manage accounts for over forty dog training business owners, it works 1000X better than what your “average” Google Adwords manager does. In fact, this is the “secret sauce” that gets so many desperate dog owners to call you. And believe me– our approach to Adwords is a jealously guarded secret. Which is part of the reason this is a “done for you” service. I don’t want cheap copycats running out and copying what I’m doing. Not… in… the… plan. First, the management fee– which includes the setup and ongoing management of your Adwords campaigns, the landing page hosting, the landing page itself, tested copywriting, design, and five call tracking, forwarding and call recording numbers– all included for just $550/month. However– if you schedule a free consultation with me and say, “Adam… let’s do this!” during our phone conversation then you’ll get it for the discounted price of just $499/month, cancel anytime. But you’ll only get the discounted price if you take advantage of my generosity during our phone conversation. Now, you’re welcome to take as much time as you need to think it over. But if you’re the type of person who procrastinates and likes to put off making a decision and call us back a week or a month or a year later– then you’re paying the full price, Skippy. So, by the time we get on the phone– be ready to take action if this seems like the type of thing that would benefit your business and your life. The second part of this is the ad spend. The ad spend is what goes straight to Google to make the ads run. I take care of all of this for you. But how much this costs depends on how many leads you want and whether you’re in a big city, a medium-sized city or a smallish city. $35/day in ad spend if you are in a smaller market. This will typically generate 17-30+ desperate dog owners with money-in-hand, calling you each month. $65/day in ad spend if you are in a medium size market. 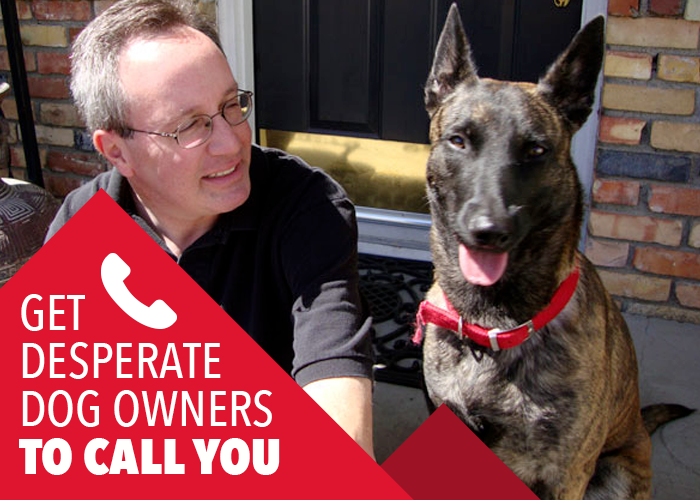 This will typically generate 20-55+ desperate dog owners with money-in-hand, calling you each month. $100/day in ad spend if you are in a large, competitive market. This will typically generate 30-75+ desperate dog owners with money-in-hand, calling you each month. ** Please note: Your ad spend budget must fit the size of your market/city otherwise you’re going into a gun fight without enough ammunition. Google Ads/Google Adwords is not cheap but it will give you an excellent return on your investment. The math makes sense if your average lifetime customer value (how much you make from each client) is at least $1,000. Even better if it’s $1,500+. My strategies work, and I know that if we work together you’ll make money. I know what it takes to set up and manage Google Adwords campaigns to create a consistent flow of leads and new customers for your dog training business. I use a month-to-month contract. You’ll be able to track your return on investment (ROI) down to the penny. Why a month-to-month contract when so many other Google Adwords agencies want to lock you into a 6-month or 12-month contract? Because I know that if I can get your campaigns “dialed in” then I’m going to be your new best friend. And if I can’t, then I don’t want you cursing my family name every month when you pay your credit card company. It’s that simple. If it doesn’t work for you then it doesn’t work for me. Nobody does this in the Adwords management industry. As you can imagine, I’ll get a LOT of interest from this letter. This Is NOT For Every Dog Trainer. I’m VERY selective about who I’ll speak with and I have a strict (but reasonable) set of criteria that needs to be met in order for us to proceed. You must already be making money from your dog training business. Look– it takes money to make money. Not a lot of money, but the days of spending $200 a month and getting 10 clients are long gone. You must already know how to talk with prospective clients when they call. This means that you’re getting sales and clients already and you’re comfortable selling yourself and your services. You must be willing to invest at least the recommended ad spend budget (see above) that is appropriate for your market. We want to to set you up for success and to make sure we’re not wasting your time or ours. In order to get enough quality leads, data and feedback from your campaigns and to optimize and scale your “ad groups” for maximum profits– your ad spend budget must be appropriate for your market. I can help you determine this if you’re not sure. You must have a good reputation in your city. Everything we do together will not only be bringing you more customers, sales, and profits, but we’ll be doing it in a way that creates MASSIVE goodwill in your market. In other words, you need to be legit. If you’re living in your van eating ramen noodles every night… this isn’t for you. If you meet the criteria above and you would like to talk with me personally about getting you more leads and customers– then I’ll happily set aside some time for you. First, you’ll need to schedule a call with me. Don’t worry, it’s simple and unobtrusive. Just use my calendar app and pick a day and time that works well for you. Once you’ve booked your free consultation, our initial call will be about 30 minutes. I’ll listen to you as you explain your business and we’ll see if we’re a good fit for each other. This opportunity is extremely limited because of the nature of this offer. See, I only accept one dog training client per market– depending on the market. (A market is a city or town or territory). Because I won’t run ads against my own clients’ ads if I’ve determined that the potential volume of queries is extremely competitive or quirky in your market. If another dog trainer in your city hires me before you do… tough cookies. Those are the breaks for not taking action sooner. If you feel this is right for you then please schedule a free phone consultation with me. P.S. We typically see a 5-11X Return on Investment (ROI) for most of our clients. So, if you’re ready to stop lying in bed at night and worrying about how you’re going to get your dog training business to the next level– schedule a call with me. Copyright © 2019 Dog Trainer Toolbox.